Many science students find themselves in the midst of graduate school or sitting at a lab bench, and realize that they hate lab work! Even worse is realizing that they may love science, but science (at least academic science) is not providing many job opportunities these days. What's a poor researcher to do !? This book gives first-hand descriptions of the evolution of a band of hardy scientists out of the lab and into just about every career you can imagine. Researchers from every branch of science found their way into finance, public relations, consulting, business development, journalism, and more - and thrived there! Each author tells their personal story, including descriptions of their career path, a typical day, where to find information on their job, opportunities to career growth, and more. 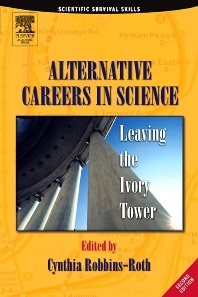 This is a must-read for every science major, and everyone who is looking for a way to break out of their career rut. First-person stories from researchers who successfully made the leap from science into finance, journalism, law, public policy, and more. WHAT IS A TECHNICAL WRITER? WHERE CAN YOU GO AFTER TECH WRITING? SHOULD YOU BECOME A SCIENCE WRITER? HOW DO I BECOME A SCIENCE WRITER? IT IS SCIENCE, BUT IS IT NEWS? HOW DO YOU EXPLAIN DNA IN THREE SENTENCES? WILL ANYONE READ WHAT YOU WRITE? SO HOW DO YOU GET THIS JOB? WHAT IS NEXT IN MY CAREER PATH? WHAT DOES A BIOTECHNOLOGY ANALYST DO? HOW CAN YOU GET THIS JOB? HOW DID THIS HAPPEN TO ME? WHAT DOES A POLICY ADMINISTRATOR DO ALL DAY? WHAT JOBS ARE AVAILABLE IN REGULATORY AFFAIRS? HOW DO YOU GET INTO REGULATORY AFFAIRS? WOULD YOU MAKE A GOOD BIOMEDICAL CONSULTANT? Chapter 15: SALES AND MARKETING: So You Want to Sell? HOW MUCH DO I MAKE? HOW DO YOU PREPARE FOR THIS SORT OF CAREER? WHAT ARE THE PROS AND CONS OF THE JOB? HOW OFTEN DO I HAVE A HAIR-ON-FIRE DAY? BACK TO ACADEMIA BUT NOT TO THE LAB! HOW DO I BREAK INTO THE PROFESSION IF I DON’T HAVE THESE SKILLS? YOU HAVE THE JOB! NOW WHAT CAN YOU EXPECT? WHERE DO I GO TO FIND OUT ABOUT PR? HOW DO I PREPARE FOR A JOB INTERVIEW? WHERE CAN I FIND A PR JOB? GETTING STARTED: WHAT SKILLS DO YOU NEED AND WHERE DO YOU GET THEM? WHERE DOES A CAREER IN SCIENCE POLICY LEAD? WHAT DOES AN ECONOMIC DEVELOPMENT ADVISOR DO? WHAT DOES IT TAKE TO DO THIS JOB: HAVE YOU KISSED THE BLARNEY STONE? HOW DID SCIENCE TRAINING HELP? WHERE CAN YOU GO FROM PROGRAM MANAGER? WHAT OPPORTUNITIES EXIST IN THE MILITARY? Cynthia Robbins-Roth, Ph.D., left academia to pursue a science career in the then-emerging biotechnology industry. Her career detoured through business development before her entrepreneurial spirit compelled her to start up her own biotechnology consulting and publishing business, BioVenture. Because of her scientific insight, irreverent manner, and ebullient nature, Dr. Robbins-Roth is a popular speaker on alternative careers for scientists, as well as a recognized biotech industry expert. Bioventure Consultants, San Mateo, CA, U.S.A.
"After my Ph.D. I realized that although I enjoyed science, I felt that my skills might be better applied to enabling the application of science within a more commercial context. Reading the experiences of others in this book gave me the confidence to move into another area of work. After spending two years in university technology transfer, I now negotiate Strategic Alliances on behalf of Pfizer and use my scientific knowledge and experience on a day-to-day basis." -Philip McGurk, Pfizer, California, U.S.A.